In many cases, the contact areas of load surface are only a portion of magnet face because either there are limited spaces to position the lifting magnets or the loads have patterned top surface. Permanent magnetic lifters can be used but their rated lifting strength would be derated depending on the actual contact area. As mention in our previous blog, the lifting capacity could be derated when the overhanging portions of the large plate metals cause themselves to droop and decrease their actual contact area with the magnet face. When the sheet is uneven or has flat perforated surface, the magnetic circuit cannot form a solid path through the openings and thus the magnetic pull force would be much less proportionally to the contact area. Besides the amount of sheet contacting the lifting magnet face, the composition of the metal is also critical to the magnetic lifting power. Greater the carbon content, the less effective lifting strength. In other words, the magnetic circuits need to have full penetrations from one pole to the other. In the past, for instance, we have received inquiries on lifting dies vertically and the lifting magnets can only be place on the top of each die. Their top surfaces only cover approximately 1/5 of the lifting magnet bottom face. Thus this customer would need a lifting magnet with rated holding capacity 5 times of the loads’ weight, assuming that the carbon content in the metal is low and the top surface is smooth and clean with zero air gap. 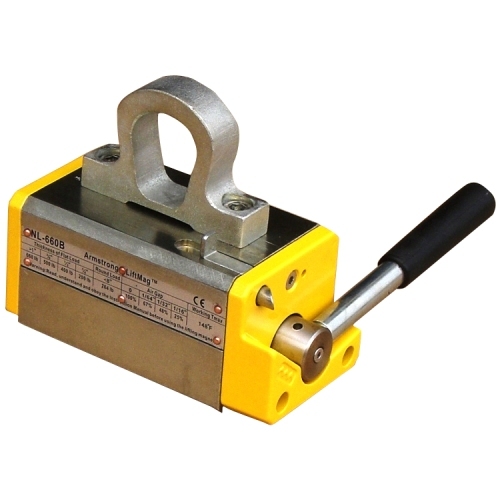 Due to less paths of magnetic circuit to attract the metal load, any minor vibration can easily release the load from the magnetic lifting device during operation. Similarly, all lifting jobs on circular or pipe loads only have a portion of the magnet’s maximum holding strength. An operational rule of thumb – if you have difficulty rotating the power handle, the magnetic circuit is probably having a hard time forming solid paths for attractions. Never apply extreme force to rotate the handle. Because that there is a wide range of different metal loads our customers handle, in order to provide recommendations on lifting magnet systems, we ask in details on what the shape, material and condition of the load and sometimes request photos to get better understandings. Our technical team often provide several recommendations on our stocked permanent lifting magnets or custom made magnetic devices to allow our customers to have different financial and operational options. To ensure the highest standard of safety, partial magnet face contact must be taken into account when estimating the derated lifting power. Contact us for any questions or concerns.